At last week’s UnConvention planning meeting, we heard from Ali Momeni, a professor at the University of Minnesota. Ali’s class, “Art for the People / Art on Wheels”, is in the process of building three mobile projection units, seen below. 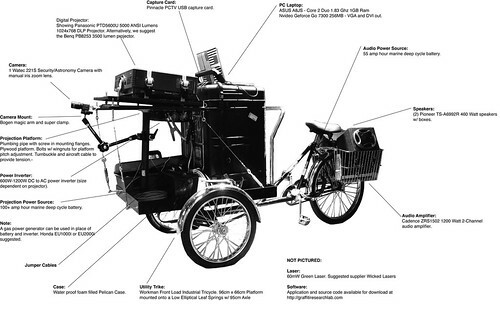 In brief, the units consist of a three-wheeled work bike, a 5000 lumen projector, camera, electric generator, and speakers. The design is inspired by some of the work done by the Graffiti Research Lab’s Laser Tag. Ali’s class has been documenting their process on their class blog.One of the very interesting things they have up there is a panel discussion with some artists, lawyers, and police officers to discuss the legalities of outdoor projection: what buildings can be projected on, what are liabilities for traffic, etc. Very interesting to anyone that’s ever done or contemplated doing outdoor projection. I think it is safe to say we’ll be seeing more from Ali and his class. It should also be noted that the GRL is going to be at the Spark Festival, going on this week. Their lecture is happening Wednesday the 27th at 12:30 in the Regis Center. If you’re a fan of the GRL, this is a great opportunity.